Grab a Bigen Prominous Color Milky for free and turn your hair color to get prepared for coming Chinese New Year! 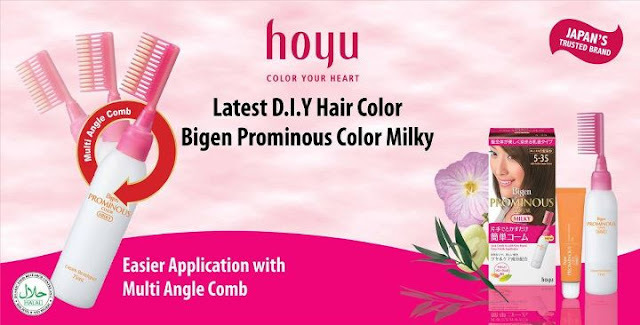 First 200 Hoyu Facebook's fans who repond to this free trial contest can get a box of Bigen Prominous Color Milky worth RM31.90 for free. What are you waiting for ? Sent in your particulars (name, address, contact/ email & IC No.) now to thian@hoyu.com.my and hit the "like" now!!! 1.) Each participant is entitled to 1 prize only. 2.) Winners have to collect the prize before or by the redemption deadline mentioned; collection after the deadline will not be entertained. 3.) Hoyu Malaysia will not be responsible for any lost, late and misdirect email. 4.) Judges' decision is final and no correspondence will be entertained. 5.) All winners will be notified by email blasting. 6.) Hoyu Malaysia Sdn. Bhd. reserves the right to substitute any prizes with others at similar value without prior notice. All prizes are not allowed for any transferable, refundable, or exchangeable for cash. 7.) Transportation cost for prizes, accommodation and transportation for collection of prizes shall be borned by winners. Prizes’ collection at Hoyu Malaysia office @ Plaza Mont Kiara. 8.) Any damages or lost in prizes delivery process will not be beared by Hoyu Malaysia Sdn Bhd. 9.) Prizes combining in one delivery are not allowed. Each delivery payment only entitle to one prize delivery. 10.) Hoyu Malaysia Sdn. Bhd. reserves the right to publish the names and photographs of the winners for publicity purposes. 11.) By participating in this contest, participants agree to abide by the rules and regulations and decisions of the judges. 12.) By participating in this contest, participants undertakes that it shall not bring any claims or actions against Hoyu Malaysia Sdn. Bhd. whether in contract, or otherwise. 13.) Hoyu Malaysia Sdn Bhd has the authority to amend or make changes on the terms and conditions.